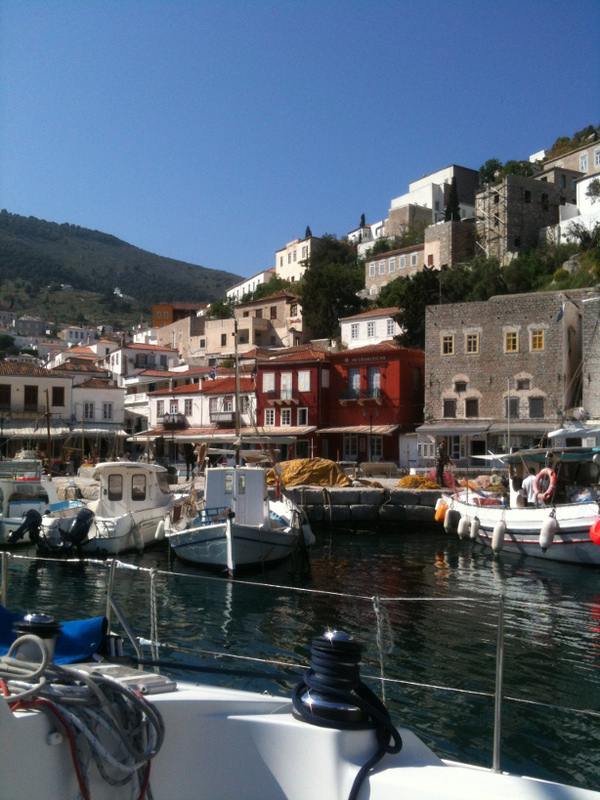 Last Wednesday, we sailed back from Hydra, a cosmopolitan island in the west Aegean Sea, to the picturesque fishing village of Perdika on the island of Aegina. 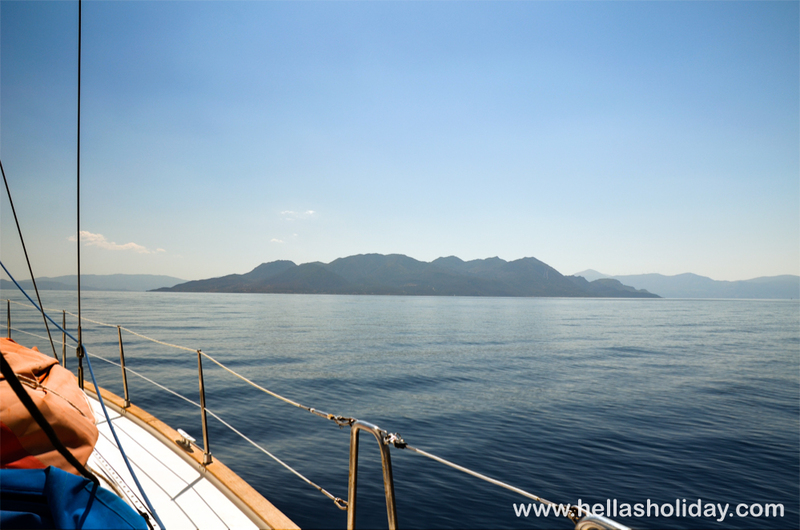 The video shows a small excerpt of the wonderful sailing conditions we had and was taken in the Saronic Gulf in the middle of the afternoon, a few nautical miles away from Aegina. The sailing yacht we were on and which you can see on the video is a 45 feet and over ten tons Jeanneau Sun Odyssey 45.2 from 2003. 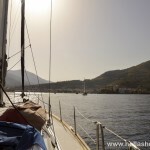 This video is a tiny sample of the great sailing fun we had during our one week non-tidal day skipper course in Greece. 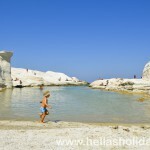 Which type of activity would allow you to learn, while having fun and discovering amazing places in Greece? 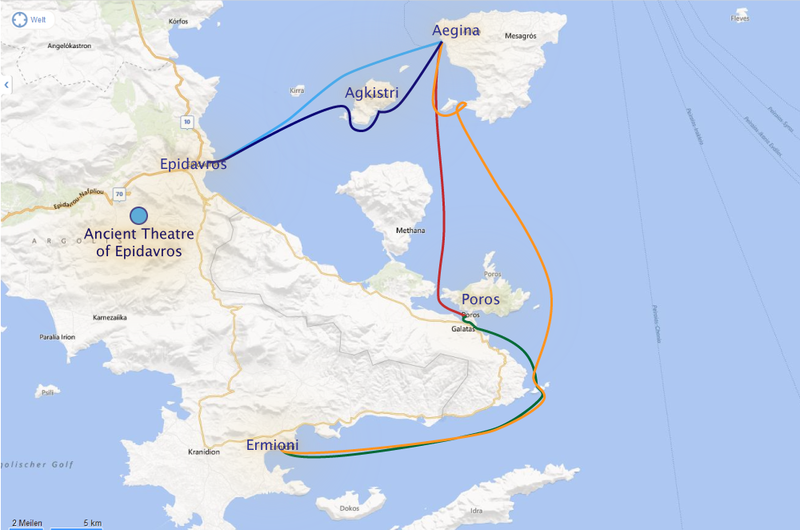 No doubt that —for a country like Greece, which is surrounded by sea and counts a few hundreds of beautiful islands— this activity would be sailing. 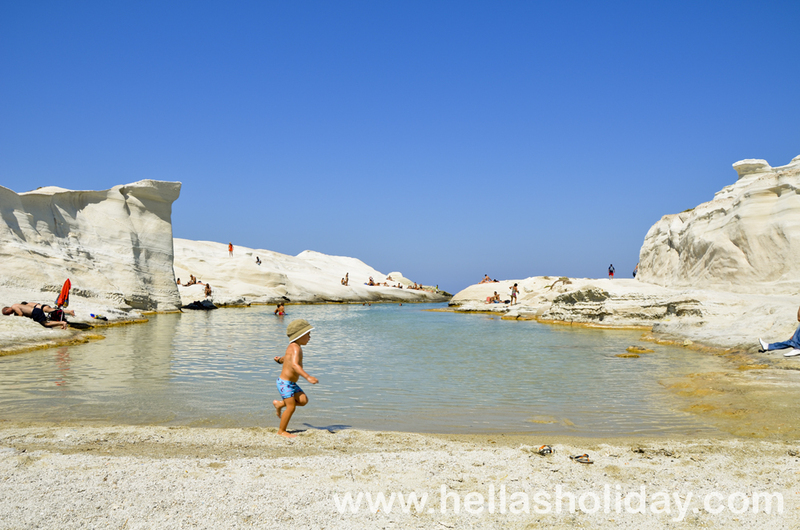 That is why last September after our holidays on the island of Milos, we decided to continue our holiday adventure by joining a five-day yacht sailing course. 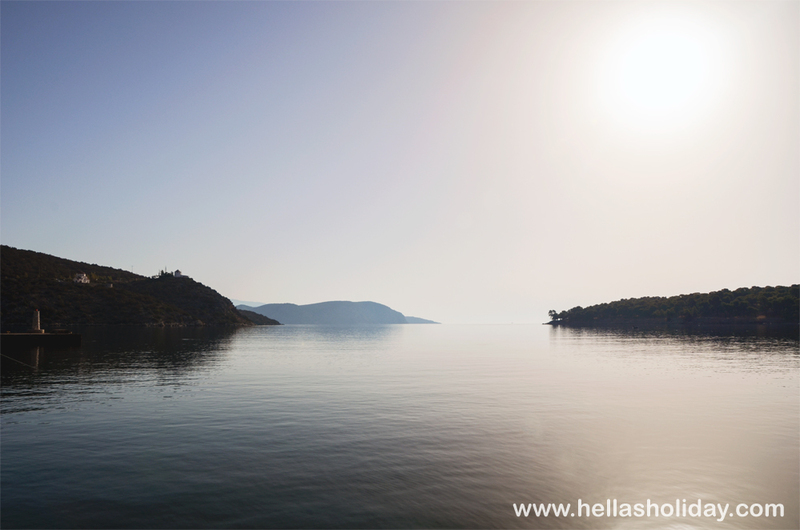 The course itself, which started in the island of Aegina, only one hour reach from the port of Piraeus, seemed to be a perfect match for us, as it combined leisure and learning in a relaxed schedule. 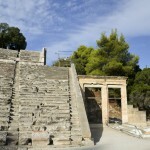 During these five days we would be sailing in the Saronic and the Argolic gulf and mooring every evening to spend the night at a different port. 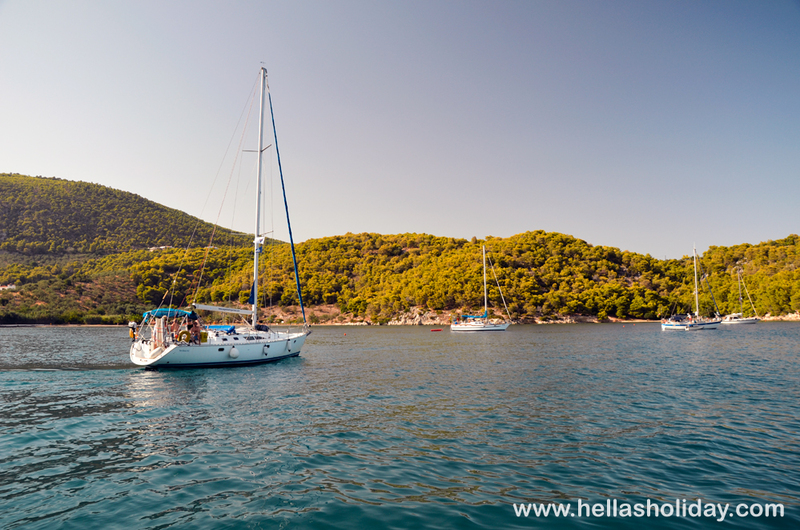 Prior to starting the sailing course, there were a few formalities to go through and for this purpose we first headed to the sailing school’s office in Aegina. We were warmly greeted and had the chance to meet our instructor and the rest of the crew we would be sailing with during the week. Our instructor for the week would be Maria from Ireland and the two other crew members were Gaspare from Milan and Eugene from Belfast. Gaspare already had experience in race sailing and he was taking the training for Day Skipper, while Eugene -like us- had no previous experience and he was taking the Competent Crew training. We also got to choose our sailing gloves, which proved to be very useful in protecting the hands against burns while dealing with the various lines and halyards on the yacht. Also part of the welcome package was a booklet resuming all the theory required for this practical sailing course. 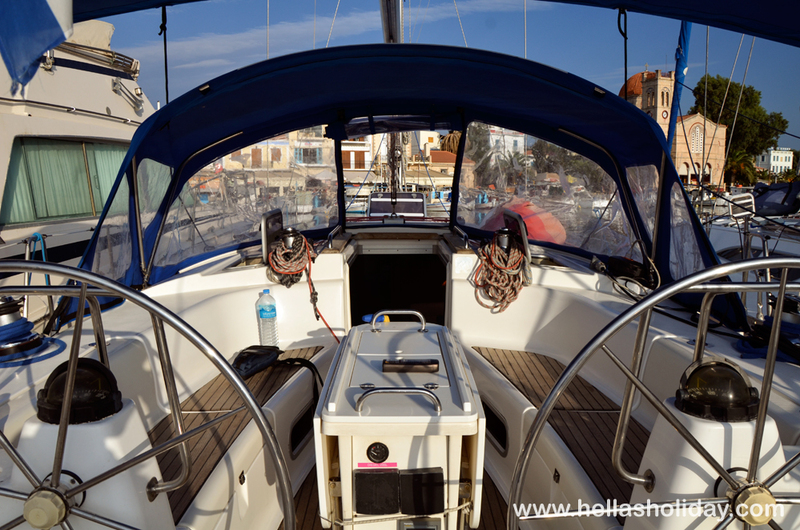 Once we went through the formalities, we headed to our yacht, which was moored at the port, for some general yacht information and safety instructions especially concerning the correct usage of a life jacket on-board. 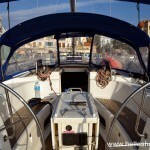 Our yacht for the course was named Philip and it was an impressive Bavaria 44 of —as its name indicates— forty-four feet in length. 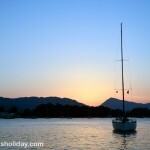 For the first evening, the sailing school had booked a table at a local taverna in front of the port, in order to get to know each other better as well as introduce us to the delicious local dishes. Other instructors and crew members from the parallel sailing class who would be sailing on Philip’s sister yacht, Phoebe. 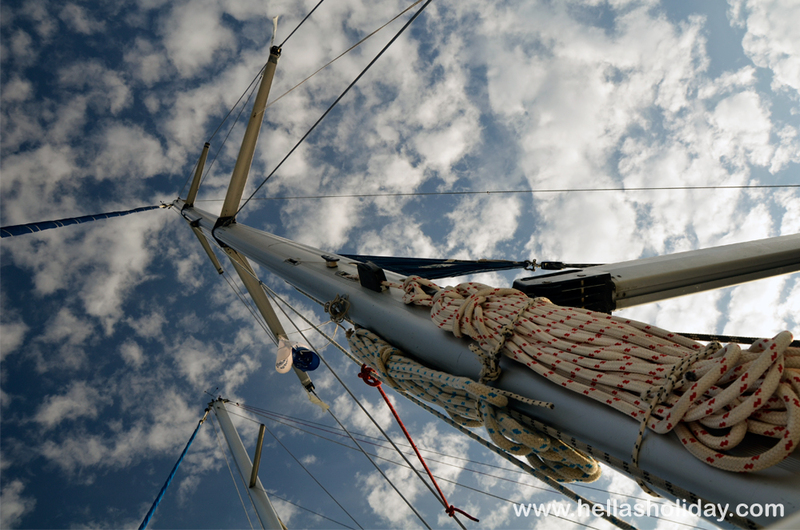 After a great treat of Greek food and listening to funny sailing stories we headed back to the boat for the first night sleeping on board. Our first day started by waking up at around eight o’clock, we had breakfast and at ten o’clock we were ready for the briefing of the day. Before leaving the port we were shown how to handle and direct the boat under motor, and we were given hands-on instructions on how to use the winches. The winch is a device which allows you to pull in or let out the lines that control the sails, when these lines are under tension. We started the motor and exercised a few yacht manoeuvres inside the port, such as targeting and reaching a mooring slot. 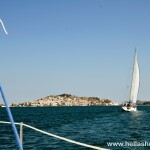 After around an hour of practising, we left the port to begin our journey. 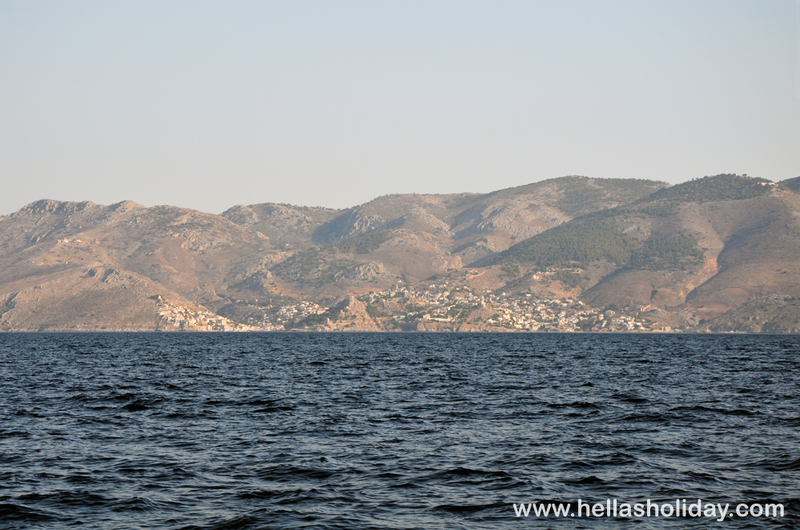 We started off by sailing in the Saronic Gulf, heading from the port of Aegina towards the island of Poros, where we would be arriving by late afternoon. 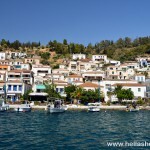 Poros is located in the southern part of the Saronic Gulf and it is separated from the mainland by a narrow and —at places— quite shallow sea channel. 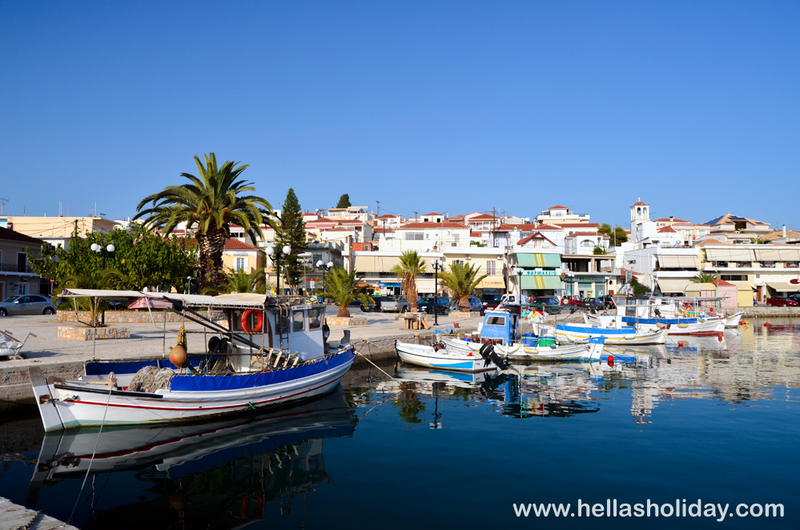 The town across the channel is called Galatas, and it is located in the north-eastern part of Peloponnese, next to the peninsula of Methana. 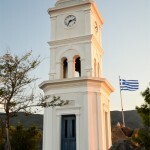 Like Aegina, Poros is popular among Athenians for their weekend holidays. During our journey we did some more exercises and learnt our first three marine knots; the clove hitch, the bowline and the figure-of-eight. 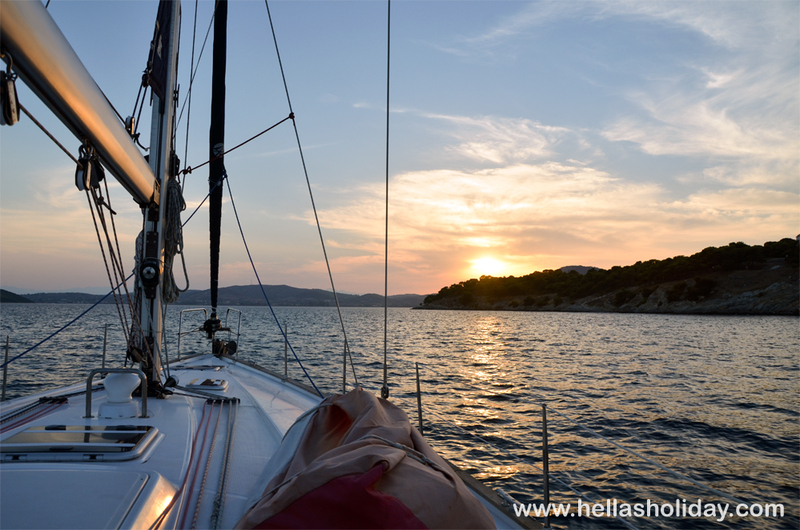 The weather conditions were good enough for us to switch from motoring to sailing and so we furled out the main sheet and then the head sail, which was a Genoa, and enjoyed our very first moments of sailing along with the wind. 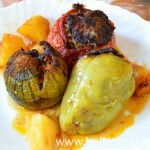 This first day being quite busy with various tasks and loads of new information, we did not manage to anchor somewhere for lunch so we simply had light lunch on the yacht while sailing. 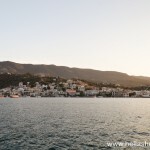 By the evening we reached the port of Poros, where we anchored for the night. 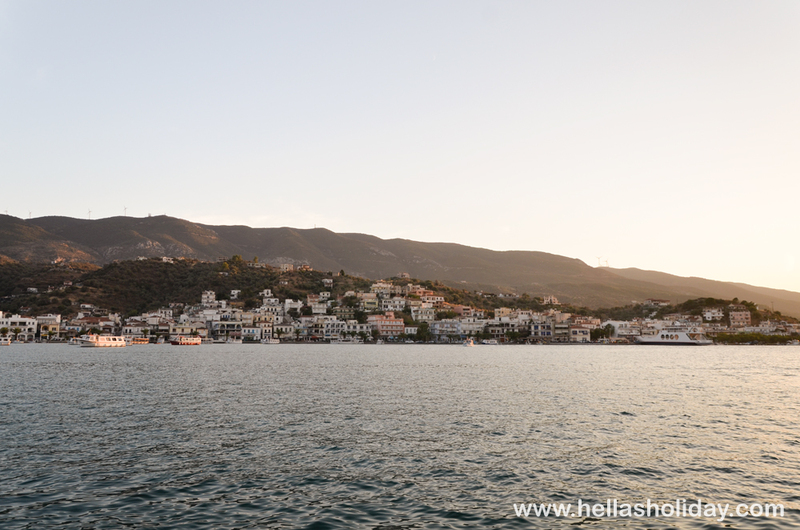 Having had an intensive day we rewarded ourselves with a gigantic waffle with praline, toffee ice-cream and topped with chocolate sauce at a cafe slightly further along the seafront of Poros, opposite the town of Galatas. 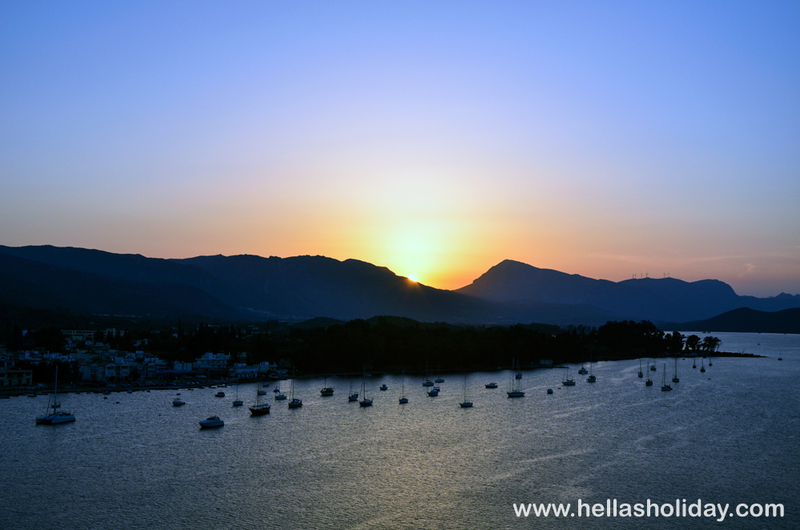 Later, we joined the rest of the crew from both Philip and Phoebe for a relaxing dinner at a local tavern, hidden somewhere in the narrow streets of Poros. Right before eating we did not miss the occasion to play with the Taverna owner’s dog, which was surprisingly sociable with everyone. 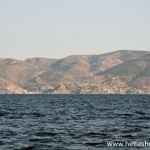 The next leg of the journey, on day two, would include a sail from Poros towards Ermioni. 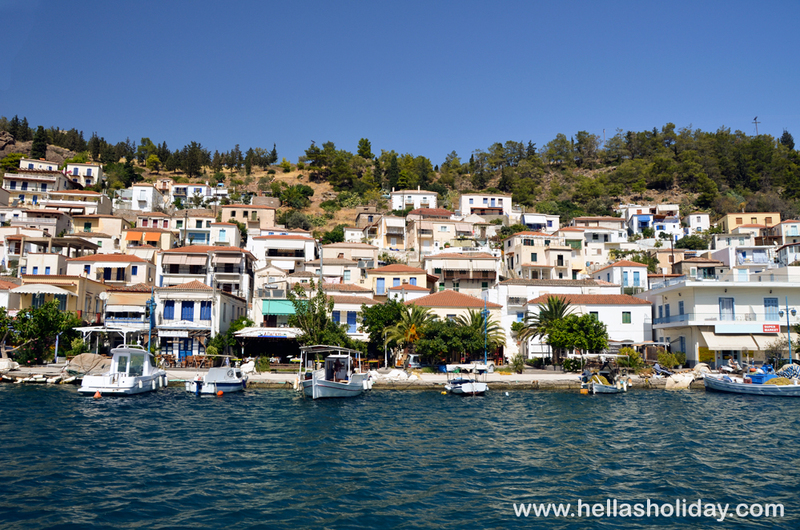 Ermioni is a peninsula and small town in the Peloponnese between the Saronic and the Argolic Gulf and facing the cosmopolitan island of Hydra. 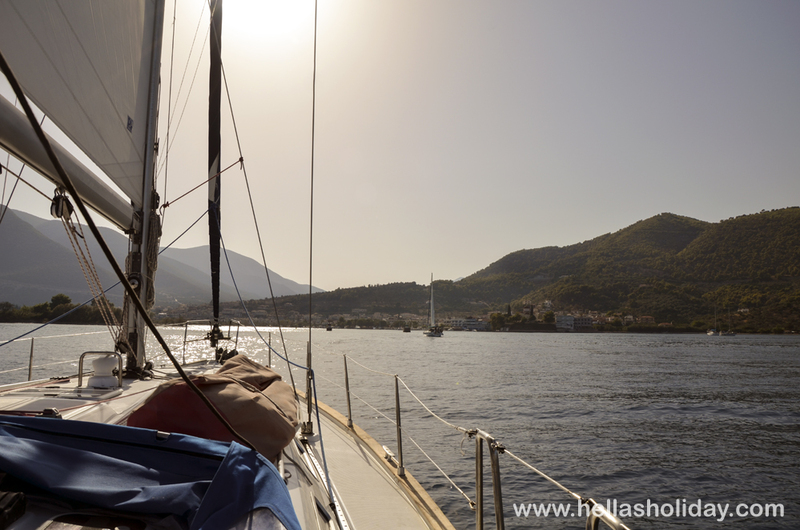 After a good breakfast at a cafe at the port of Poros, also profiting from their free wireless internet, we started the day with some exercises including the 90 degrees mooring and fastening up the two stern lines of the yacht to the kleets on the pontoon. There we learnt the so-called “OXO” knot to tie up the lines on the stern kleets, which is of critical importance for a secure mooring of the boat. 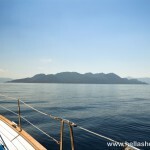 After having experienced enough this way of mooring, we set sail towards our destination. 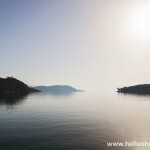 To reach Ermioni, we sailed not too far away from the coast and like that we were also able to watch the beautiful coastal scenery that the mainland offered us. 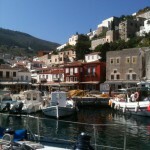 Most ominous on our journey would be the island of Hydra which we passed quite nearby and were we could see the colourful houses. On our way to Ermioni we got to know two more knots, the round-turn-two-half-hitches and the reef knot, and were tested by our instructor on the various parts of the yacht. 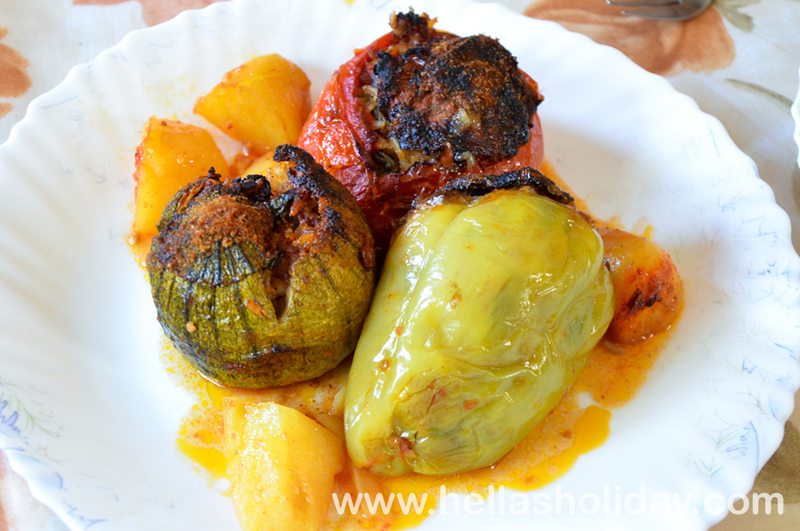 That day we had again our lunch while sailing and had the delightful chance to taste Gaspare’s pasta in a tomato and basil sauce, the Italian way! 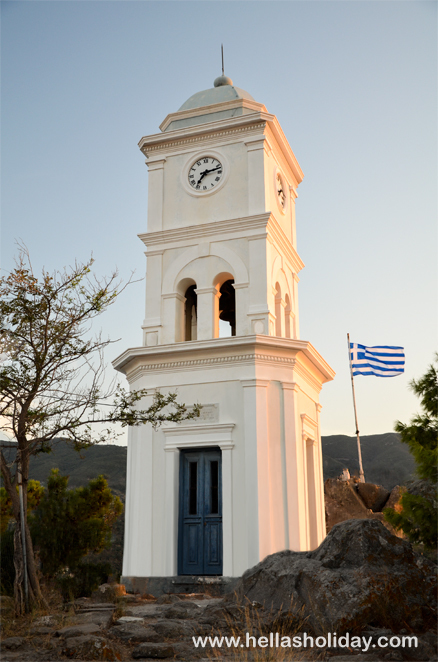 Once arrived in the port of Ermioni we had a stroll around to discover its surroundings and joined the whole team for a nice evening meal at a Greek taverna overlooking the sea. 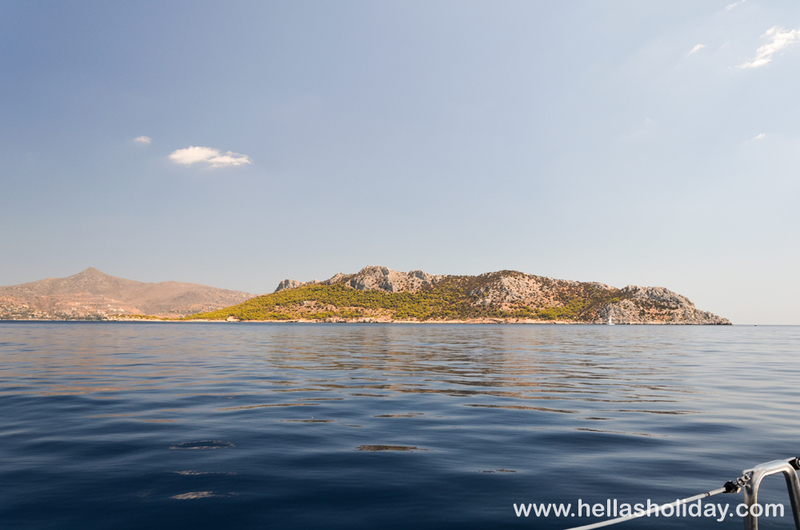 Day three would include a new challenge for all of us, as we would be sailing by night for a short distance between the port of Perdika in the southern part of Aegina towards the island’s main port. 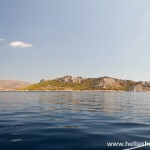 But first we had to sail all the way back to Aegina from Ermioni so there were quite a few sea miles awaiting us that day. We tried to sail —rather than motor— as much as possible in order to train sailing upwind and therefore to practise and improve our skills in tacking the boat. 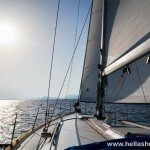 Tacking is actually a sailing manoeuvre, when sailing upwind on a close-hauled point of sailing (the wind blowing towards the front part of the boat at an angle of approximately 45 degrees), during which the bow of the boat passes through the wind and ends up to another close-hauled point of sailing. While tacking the wind moves the Genoa sheet from one side of the boat to the other and the crew needs to ease in on one side and pull in on the other side using the winches. 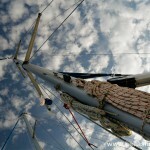 The main sail may also need to be adapted. 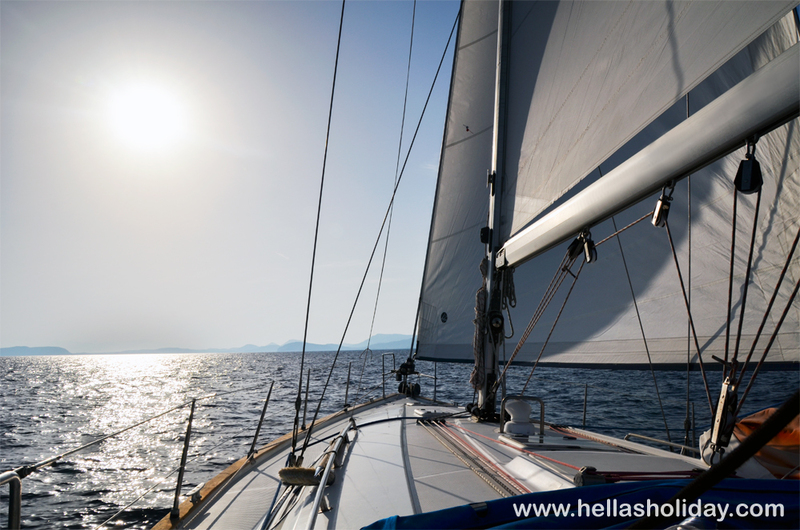 Before tacking the person on the helm would shout “Ready about?” and the crew would take position and get ready, and when the yacht would be positioned exactly into the wind the Helm would shout “Lee haul” to get the crew on the head sail do their job. This manoeuvre enables the boat to effectively sail upwind. 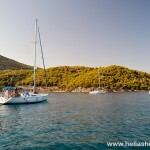 At lunchtime we anchored in a small sheltered bay and enjoyed a refreshing swim in the turquoise Argo-Saronic Gulf and then some refreshing and delicious Greek salad and sandwich. 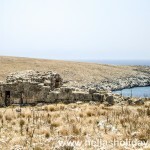 When we arrived at the port of Perdika we had a few issues finding adequate space to moor the yacht; the only slot available was one next to some large rocks, so we took extra care and more time to moor. 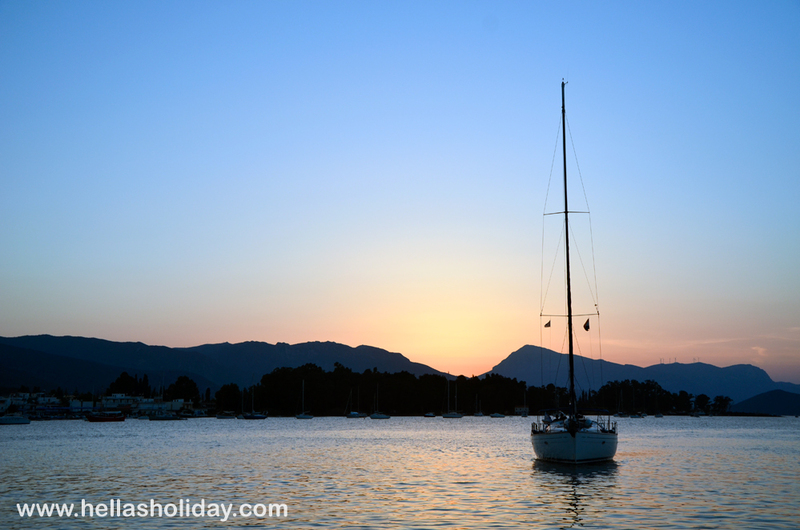 There, we had just enough time to enjoy the sun setting behind the islet of Moni, while enjoying a freddo cappuccino and a chocolate soufflé, before heading back to the yacht for our night sail instructions. 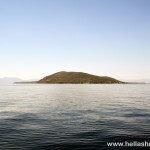 The time we set off, it was already dark and headed slowly and carefully towards the port of Aegina. During these hours of night sail we learnt practically how to observe the lighthouses and floating marks and to spot every single moving object on the sea. It was a great experience and also helped us realise how difficult it can be to spot objects such as lighthouses in the dark. It was nearly midnight when we arrived at our destination, so we decided to enjoy some Greek fast food; a delicious pork souvlaki wrapped in pita bread. 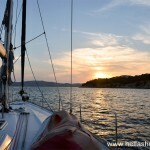 Soon, we had to go to sleep after a long and exhausting but also very enjoyable day on the sea. 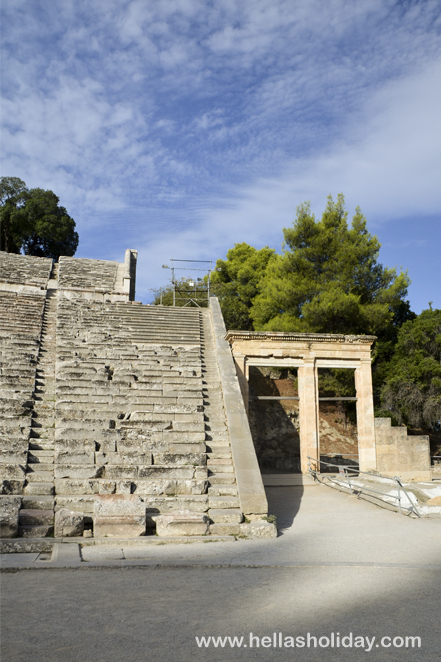 On day four, we would be heading south-west in the Saronic Gulf to Epidavros, which is famous all around the world for its majestic ancient theatre. In the beginning of the trip, we did not have enough wind to sail, but it was a good occasion to practice the man-overboard exercise, while motoring. 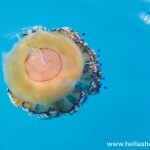 For that purpose, our instructor would throw unexpectedly a fender overboard and shout “Man overboard!”. Then we would have to react accordingly as previously shown. After a few fenders over board, we pretty much got the process that needs to be followed in the event of a person falling off the boat into the sea. Luckily, the wind picked up and we profited to practice the Gybe manoeuvre, as well as different points of sailing, such as the close hauled, close reach, beam reach and broad reach. 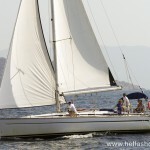 Gybe is used while sailing downwind, in order to “move” the wind around the stern from one side of the boat to the other, which includes the repositioning of the main sail and the Genoa sheet. During this manoeuvre the Helm would shout “Ready to gybe” to get the crew ready and “Gybe haul” when actually gybing. 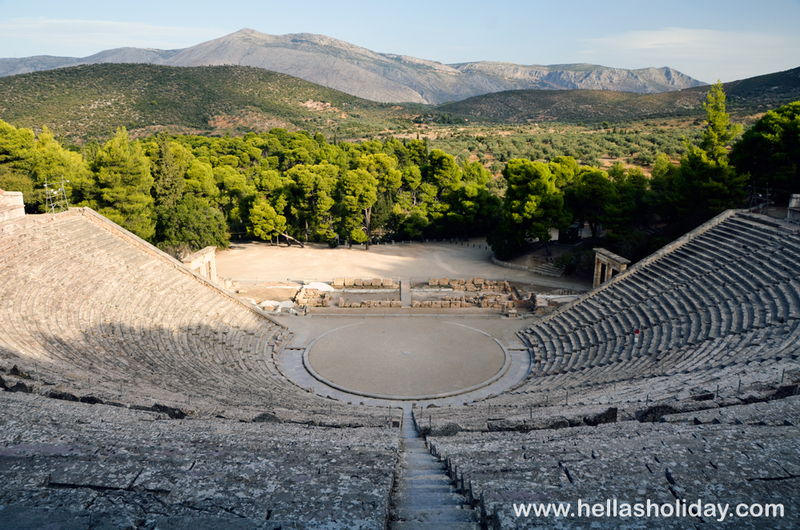 In the late afternoon we arrived in Epidavros and after all these efforts we headed to a restaurant right in front of the port and sea for some well-earned Greek beer and later on the last evening meal altogether. 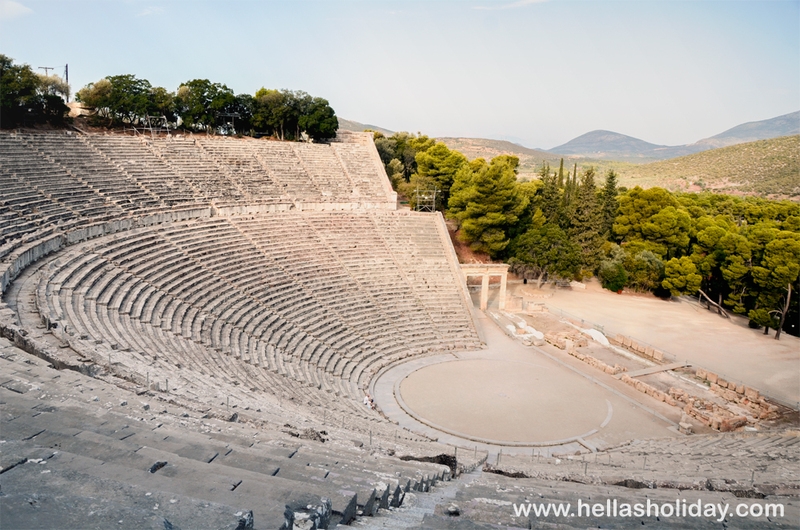 Very early the next morning we hired a taxi and visited the ancient theatre of Epidavros, which is well known all around the world for its excellent acoustics. 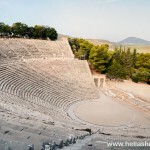 To be able to understand why, one of us stood in the middle of the theatre and dropped a little stone or a coin on the ground. The others, who were standing at the very top of the theatre could clearly and without any distortion due to echo hear the object hitting the ground. 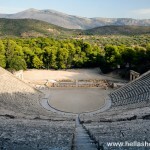 The ancient theatre was absolutely magnificent and definitely worth the early wake. 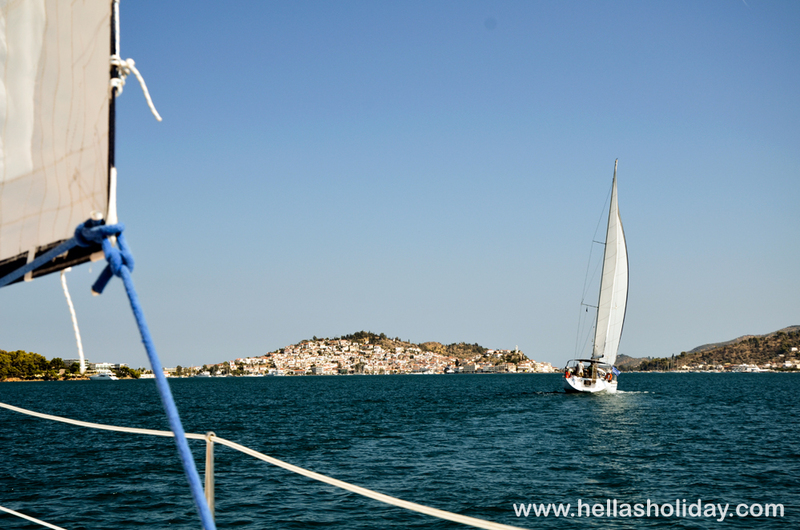 For the last day of our sailing course we headed back to the port of Aegina, from where we had departed four days before. The wind was a bit less generous with us than the previous day and we had to motor for at least half of the way. Nevertheless, we practised again a few man-overboard cases and while sailing along the wind we were able to demonstrate our newly acquired skills in mastering the sailing manoeuvres. We also got tested in our knot proficiency and had to prove our ability to use the seven essential knots we had learned earlier during the course. 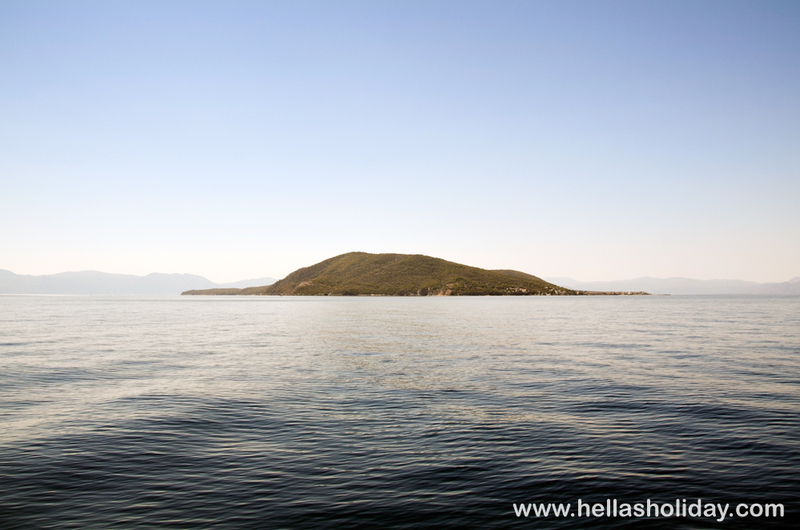 The trip back to Aegina was not too long, so we had enough time to anchor in a protected bay in the island of Agkistri, located opposite Aegina. By middle of the afternoon we arrived to our final destination, where we had the opportunity to do a last tack just before entering the port. 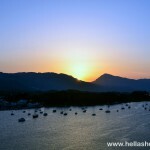 Once arrived we packed our personal belongings and went for a beer at the taverna hosted in Aegina’s Nautical Club (NOA). There we received our certificate of either Competent Crew or Day Skipper accordingly and were warmly congratulated. The staff of the sailing school had posted a photographer at the entrance of the port, who took a few nice shots of us in action during our last tack. We were able to see and buy these photos and keep them as a memorable souvenir of our first sailing experience.